REO has developed a solution to the problem of using non-IP65 rated drive peripherals with IP-65 rated variable speed drives (VSDs) by introducing a range of partially and fully encapsulated units. The problem arises when there is a design or maintenance reason for not housing external input or output chokes or brake resistors in a control cabinet. Encapsulation also means that the products can easily incorporate water cooling, either by affixing a cold plate or with integral cooling channels. The tendency in the drives market, especially in the HVAC sector, is to use drives which have an IP65 rating and which can be used as standalone devices without needing integration into control cabinets. This means that cost effective drive installations can be fitted much more quickly and with great flexibility. However, problems occur when external input or output chokes are fitted, or when the application requires the use of a brake resistor. This is particularly important for areas where space or ambient temperature is important, for example in marine or renewable applications. It is not just a choice between putting non-IP components in an IP-rated control cabinet or buying expensive IP-rated components. These components were historically designed to be housed within control cabinets to protect them from dust or moisture ingress. Furthermore, the terminations are often of an open-lug type, which add the risk of shock hazard if they are not suitably guarded. 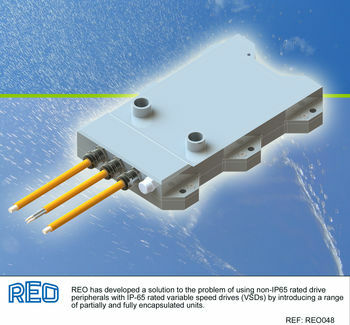 “REO solves this problem by offering a range of braking resistors, input and output chokes and even sine wave filters in ingress protection ratings up to IP65, matching that of the drives that they are likely to be used with,” says Steve Hughes, managing director of REO UK. For smaller units, REO uses custom moulds to house the products before they are potted, while larger units are fitted into aluminium forms into which the encapsulating compound is added. The finished product is very robust and not affected by moisture or dust.